Robyn Hord is planning to have hundreds of families over to talk, eat, play sports, watch sports and attend a movie. 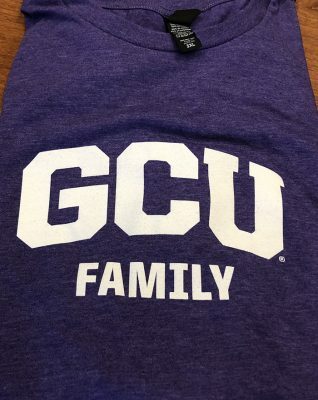 The official T-shirt of GCU Family Weekend. “There are going to be so many people here, and it is going to be such a great time; we just want to do the best that we can to extend the best hospitality Phoenix has to offer — and that’s our campus,’’ said Hord, the director of Grand Canyon University’s Family Weekend, scheduled for Friday through Sunday. Not even counting walk-in registration, it is the largest Family Weekend in the history of the fifth-year event. There were 4,239 people registered online as of Monday’s deadline. More families signed up by phone and in-person through Friday. Among the highlights of the three-day event: Chapel, performances of sold-out “Macbeth,” competitive and casual golf at the GCU Golf Course, hospitality in Thunder Alley, a showing of “Incredibles 2” on the Grove Lawn, performances by students from the College of Fine Arts and Production, performances by Spirit teams, competitive games or matches by softball, men’s soccer, women’s volleyball and men’s and women’s swimming teams (four miles off campus at Brophy High School), Thunder Bolt shopping spree, family sand volleyball, and a family service project. 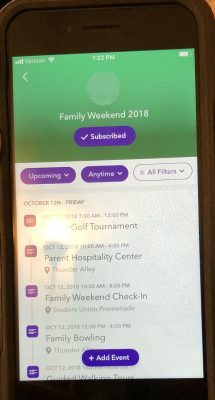 Families can check the event schedule on the GCU Engage App under Family Weekend 2018 or click here with the understanding that the schedule is subject to change. For example, Chapel will be at 10:15 a.m. (doors open with refreshments at 9:30 a.m.) at GCU Stadium. Download the GCU Engage app to keep abreast of Family Weekend events. 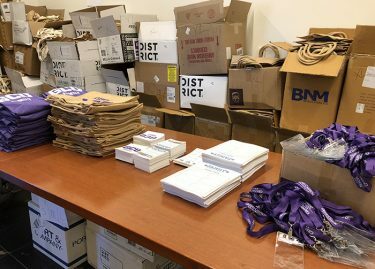 Along with the plethora of activities, families will receive a GCU burlap bag stuffed with a GCU Family T-shirt, name lanyard, a fan for Chapel, bumper sticker, Sodexo discount coupons for meals on campus, a bingo card, a list of area hiking trails and an invitationto the service project. One lucky attendee will take home much more – up to $500 of merchandise in a 60-second shopping spree at Lope Shop, known as Thunder Bolt. The second annual Thunder Bolt event begins at 3:30 p.m. on the Student Union Promenade with a Lil’ Lopes Cheer and Dance clinic performance. To be eligible for the drawing, attendees must check in at a designated Family Weekend booth. Their odds of being chosen can be increased by participating in the academic stamp game: As each family visits specific sites around campus, they can get their card stamped. Each stamped square earns an additional three raffle tickets to the Thunder Bolt drawing and other prize drawings. “Why are the students here? To get an education, so I want the parents to see the Colangelo College of Business, I want them to see the new 3-D printer, I want them to see all the state-of-the-art buildings,’’ Hord said of the inspiration for the academic stamp game. The staging area for Family Weekend goodies. 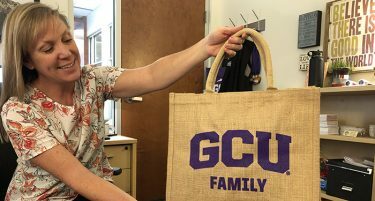 Hord, the mother of a GCU sophomore, is in her first year in Welcome Programs after working the past four years in student conduct. “I am still serving students by helping parents get on board with what we have to offer here,’’ she said. Among her first orders of business was updating the Parent Council. It is a 14-parent board in which each member serves two years. Half the council was returning for their second year when she came aboard, and the other half she selected via interview. Families attending Family Weekend can meet members of the Parent Council at the Family Hospitality events on Friday or Saturday — they will be wearing purple polo shirts and name tags. Families are encouraged to hike. There are several members from Arizona and the rest are out of state, including Colorado, Washington, Illinois and New Hampshire. They help with new student orientation in the summer and Welcome Week. In monthly conference calls, they discuss issues with each other and Hord. While college is a special time in which young people establish their independence, the adjustments can be challenging. Robyn Hord, showing off a Family Weekend bag, is excited to host families. 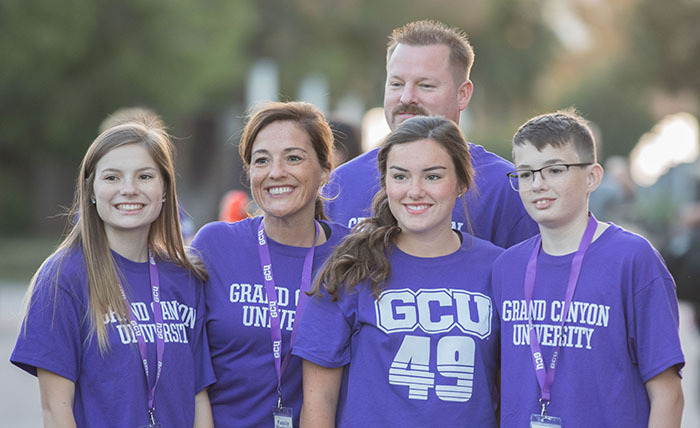 The bonding of GCU families from all over the country during the weekend is a precursor to the unveiling of “Lope Families,’’ an initiative starting in Phoenix, Los Angeles, Denver, Seattle and other cities that have a large concentration of GCU families. Similarly, satellite service projects will be implemented in various cities on the same day, Feb. 9, as the Lope Families service project in Phoenix. With the help of the Parent Council, Hord is using Family Weekend to survey parents about their interest in connecting with other GCU parents in their home areas. Another key initiative is the service project at the senior citizen home adjacent to campus, Colter Commons. Families can volunteer to spend time with senior citizens. Families will play bingo with the senior citizens, and if weather permits, outdoor activities on the lawn are planned, such as croquet. Spiritual Life is the co-sponsor of the event since its members visit Colter Commons every Wednesday. That kind of collaboration is essential for all aspects of Family Weekend. Hord has worked with numerous departments, including Event Services, the Lope Shop, Spirit teams, GCU Golf Course, Thunder Alley, Student Affairs, the deans of the nine colleges, Marketing, Public Safety and Sodexo. “It takes a whole campus,’’ Hord said as she headed off to continue to prepare for her guests.